after a small group of us went to see art in the streets at the geffen contemporary at moca today, we headed over to wurstküche for lunch. it was a short walk and good for a group. you order at a register, so there is no worry of splitting up the check, and there are huge communal tables with benches that can fit groups of almost any size. i was hoping since it was close to 2p on a friday afternoon that it wouldn’t be too crazy busy, and thankfully as we turned the corner the line had barely creeped out the door. believe me i have been there plenty of times to know if the line is down the street you can be waiting upwards of an hour or more depending how long it is. i usually order the rattlesnake + rabbit with jalapeño, and sauerkraut as a topping, but for some reason i was thinking about changing it up a bit and trying something i hadn’t had in a while like the duck + bacon with jalapeño. well it must have gotten into my subconscious enough, because that is what arrived at the table. i don’t even remember ordering it, but i am so glad i did, because it was a reminder to try new things and not always go with the status quo. 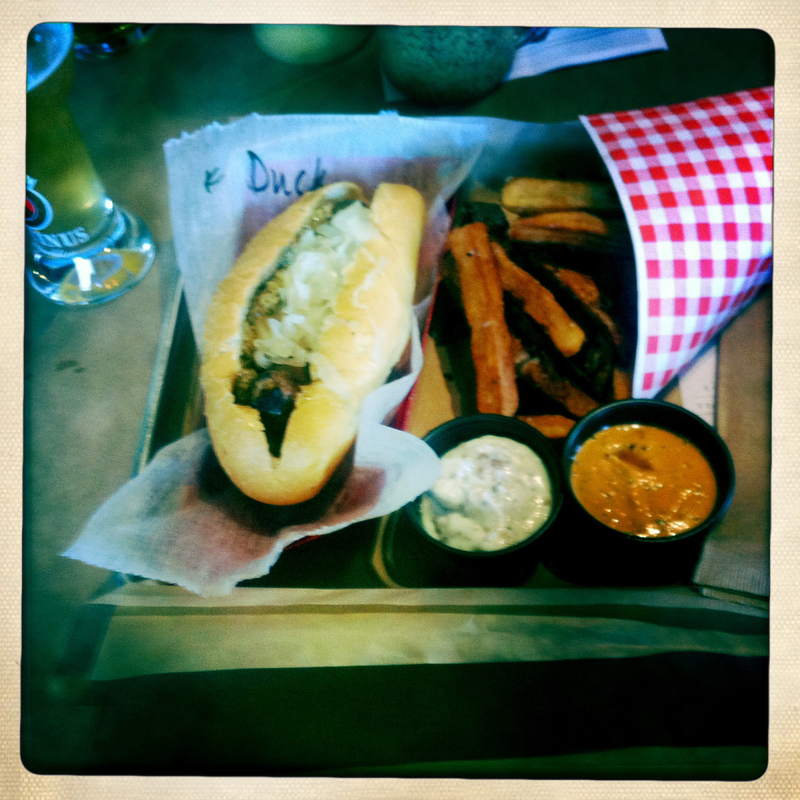 i also ordered a small fries, called a klein, with the chipotle aioli and blue cheese walnut and bacon dipping sauces. one sauce comes with the klein, and 2 come with the groot (large), but i can never decide between them, so i order them both if i get the klein. they have 5 different kinds of mustard, as well as ketchup, at the tables. i prefer the whole grain, but now having tried the duck again, i would probably try a different topping like the onions and sweet peppers and go with the honey mustard. regardless, it was still juicy and delicious. “Q: Are children and grandparents allowed? as were were finishing up, at the next table a college aged kid wearing usc shorts was helping what seemed to be his 90+ year old (great?) grandmother maneuver into her bench cane in hand, and i thought it seems as though they mean it. What’s the bun sitch these days? Last time I went, the buns had changed and dwarfed the sausage. they seemed to be the same size that i always remember, but you are right they are a touch disproportionate to the sausage, though i didn’t mind so much today. maybe the richness of the duck needed more bread? dunno. Glad to hear they’re still turning out a tasty product. Hopefully they’re rotating their beer selection. Do you feel like the vibe is different since the USC crowd discovered the place? nah, it’s still the same, and honestly other than the logo on his shorts i doubt i would have picked him as a student. although i haven’t been back at night for a while. it would be interesting to see what the crowd is on a saturday night, but there is no way i would wait in that line. i would probably just do a scout and sit at the bar. as far as beer selection, i think they will always keep a bunch of the beers the same, but usually each time i go there is something new. Rattlesnake? Seriously? With rabbit? Somehow the combination probably ends up tasting like chicken, but it does sound exotic. Do they serve things protein-style (without the buns)?